EASTHAM - This is the pondfront jewel that you have been waiting for! This completely renovated condo has 2 bedrooms, vaulted ceilings, a fireplace, and harwood floors. 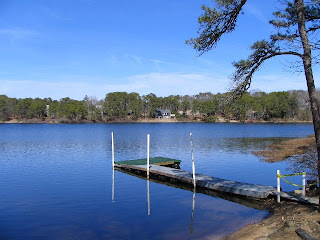 Get fabulous water views and wonderful family recreation with the condo association's private beach & dock on Minister's Pond. This condo also has clear views of Schoolhouse Pond. The condo has been a great rental property and is listed at $249,000. Go to http://nausethaven.robertsheldon.com/ for more information & photos. Lighthouse tours, kayak trips, boat building demonstrations, historical films, and much, much more. There are events almost every day in May. Go to the Cape Cod Maritime Days website..... Here. There are quite a few events at the Cape Cod National Seashore Visitors Center in Eastham. Travel+Leisure Magazine just posted their America's Top 10 Retro Escapes for 2009. The Wellfleet Drive-In theater made the 'cut' as one of the most fun escapes. The drive-in opened in 1957 (over 50 years ago!) and has pretty well remained as it was since then. Be sure to check out the slideshow and see all 10 of the retro escapes. I remember taking my family to the drive-in movies in the mid-1980's when we first came to the Cape on vacation. We had a pop-up camper and stayed at Maurice's Campground, practically across Route 6 from the drive-in. The fact that our pop-up leaked when it rained ultimately forced us to rent homes when we came out. We rented homes for about 10 years. Who knew that those rentals would lead us to buy and then move to Eastham? Short Sale - This super-cute 2 bedroom condo is only about 100 steps to the stairs at the end of Eastham's Campground Beach Rd. This cottage has been totally re-done, with newer roof and flooring, cathedral ceiling in the living room & kitchen, and a large screened-in porch. This cottage is being priced 20% under the 2009 assessed value for a quick sale. Being sold unfurnished, as-is. Check out http://735acampgroundbeachrd.robertsheldon.com/ for more photos and a Virtual Tour. Call me @ 508-237-9545 for an appointment. 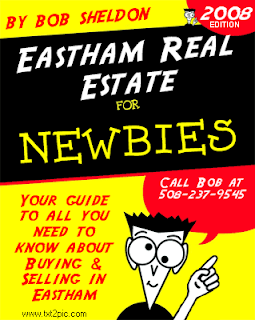 Want to check out ALL the Eastham listings?? Go to http://mls-listings.robertsheldon.com/. Eastham Town Meeting - Will Be Another Hot Debate! Eastham's annual town meeting, scheduled for Monday, May 4th, at the Nauset Regional High School, will once again be the site of a number of hotly debated articles. This year we'll 'debate' windmills (both 'personal' and commercial), water, and rental home room taxes. The Cape Codder has a fairly detailed article ... Here. Missing from the Cape Codder article was information about the above mentioned room tax. I discussed this article in this Blog...Here. In February President Obama signed a stimulus bill (The American Recovery and Reinvestment Act of 2009) that made some significant changes to the energy-efficiency tax credits. The bill extnded the tax credits into 2010 and included added and improved tax credits for a number of energy related home improvements. Go to the NationalGrid newsletter article for a better overview and links to more details. About 70 of the endangered right whales continue to feed in Cape Cod Bay, off the Eastham and Wellfleet coasts. The right whale is one of the earth's most endangered species, with only about 300 to 400 animals still thought to exist. Go to the Cape Cod Times story. Great Earth Day news! The U.S. Interior Department announced new rules yesterday that will allow the first offshore wind turbines to go up in Nantucket Sound, rules that the Kennedy family famously opposed. This development was part of an Earth Day speech by President Obama. I don't think we've heard the last of it, but these new rules should move the project at a faster pace. Go to the Discover Magazine 80beats blog for this important article. The Cape Cod Times reported that the Cape Cod National Seashore has announced a new 20 year lease on a "Cape Cod Modern" Wellfleet house to the non-profit Cape Cod Modern House Trust, for the purpose of preserving a valuable piece of architectural history. The house, designed by Charles Zehnder, is known as the Kugel-Gips House, and is located within the Cape Cod National Seashore. Go to the Cape Cod Times article to read the entire story. I've been fascinated (maybe I'm getting old) by this style of homes, built mostly in the 1950's, but seems to have been popular into the 1970's. The Kugel-Gips House was built in 1970. 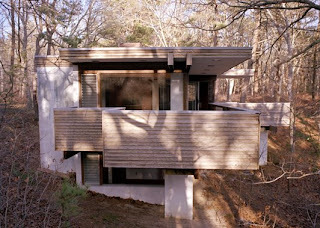 Check out the Cape Cod Modern House Trust on their (very interesting) website. In a short sale, a seller facing the threat of foreclosure enters into an agreement with their mortgage lender to accept a price for the property that’s less than the amount they actually owe on it. The seller makes no profit on the sale but avoids many of the problems that would come from a foreclosure. But, short sales have their own set of advantages and dis-advantages for sellers and buyers alike. Go to this article on AOL's real estate pages for the 'whole story'. Short sales and foreclosures have been fairly rare on the Outer Cape, particularly Eastham. That said, look for a few over the next few weeks. One If By Land, Two If By Sea - Which Was It?? 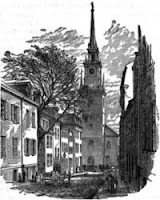 On this day (April 18th) in 1775, Paul Revere signalled from the Old North Church (via the church's sexton) that the British were coming. Well, which was it? By land or by sea? I didn't know either, but you can find out by going the the Old North Church's website. The next days' events marked the beginning of the Revolutionary War. April 19th was (until 1969) remembered as Patriots' Day. 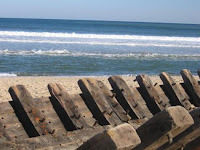 A blogger from Wellfleet has taken a few new photos of the remains of an 1800's schooner that apparently sank off the Wellfleet beach and washed up over the winter of 2007-2008. I took a bunch of photos in February of 2008 ... Here. The photos from the blog were taken over the last few days. His new photos are .. Here. What you'll see as you compare the sets of pictures is that the sand has a way of burying and unburying the wreck, which is easy (and fun) to visit, just a few hundred yards south of the Newcomb Hollow parking lot. The Washington Post, a few weeks ago, ran a wonderful article about the reclusive Edward Hopper's life and art of the Outer Cape. Edward and his wife, Jo, lived in Greenwich Village in the winter and in Truro in the summers (for over 30 years). Edward's paintings of the Outer Cape include many from Eastham, Wellfleet and Truro. Read the article ... Here. Also, don't miss the photo slideshow that accompanies this article. The picture (right) is Hopper's painting of Corn Hill in Truro. 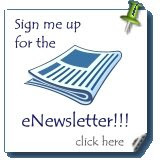 My May 2009 Newsletter Is Available Now! These two graphs didn't fit my newsletter (due out later today). The first is simply a 2+ year graph of the number of active listings in Eastham by month. It's very evident that the year has 'seasonal' cycles. Interestingly, this year seems to be lagging last year, which lagged 2007. Are we returning to 'normal'? The scond graph is a histogram of the homes sold in the first quarter of 2009 in Eastham. What we have seen is a void in the 'mid-priced' homes. This makes any average prices somewhat meaningless. The number of sales has been low, making comparisons difficult. If you own more than 20% of your home, you can simply go to your lender (or any lender) and refinance your home at the current, historically low, mortgage rates. But, with the decline of home values, this option may not be available to you. How do you know whether you qualify for help under the Federal Mortgage Assistance Program? The Washington Post ran an article that addresses this question. Read it ...Here. It's a good read. The FT says that the drop in house prices in desirable communities, combined with historically low interest rates, has created a modest boom in the area’s holiday property market. “It’s all those magical stars aligning,” says Thom. Go the the Financial Times to read the article. This 2 bedroom ranch is the quintessential Cape Cod summer cottage. This cottage is just a short walk to Cooks Brook Beach in Eastham and is on a quiet sand road. This well cared for vacation spot has been in the family for decades. This cottage will be sold furnished and "As Is". Seller is having property engineered for a new Title V septic system. Listed at $299,000. Go to http://25oquamoshodrd.robertsheldon.com/ for more information and photos. Site of First Cape Cod Windmill "Discovered"
The likely site of the first windmill built on Cape Cod was discovered - in Orleans! The 'hunt' has been underway for several months. 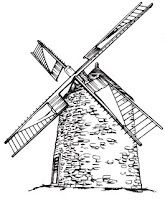 The discovery of several windmill artifacts, including 3 early millstones, within a block of each other and near a suspected site has given researchers the best evidence yet of the early site. The windmill was probably built in the 1650's and it was close to today's Skaket Beach. Read the article (and check out the photos) from the Cape Cod Times...Here. HGTV posted an article called the "10 Best Kept Secrets for Selling Your Home" on their website. I'm not sure how secret they are, but they are interesting reading. Take a look...Here. The Home Valuation Code of Conduct (HVCC) sprang out of the belief that, at least partly, the fault of the credit crises lies on the coercion of appraisers, by banks, to value homes higher than the houses warrant. The HVCC sets up a new layer of middlemen who will be immune from pressure from the banks. Appraisers will work for these middlemen. Some feel that the cure is worse than the disease, causing harm to the appraisal industry and drive many appraisers out of the system. This article is from the Appraisal Press. The Cape Cod Times posted this panorama of Eastham's Hemenway Landing a few days ago. This town landing is on the oceanside of Route 6, approximately a mile and a half north of the rotary and sits on the marsh. I've kayaked from this landing a number of times. Check out the video. For Sale By Owner (FSBO) is sure a tempting proposition. It seems, on the surface, to be a sure way to make a few percentage points on the sale of your home. Not so fast! The pitfalls are many and ignorance of the process can be painful. What are the rules for water tests, septic inspections, and home inspections? Read this RIS-Media article about FSBO? Should you go FSBO? I've been saying that Outer Cape Cod (especially Eastham) real estate is a great investment for several years. RIS-Media published an article that highlights why now is the time to buy your second home. The 5 reasons are simple .... go HERE to read the article. In any complex sport, beginners seem to make simple mistakes that more experienced folks wouldn't. Likewise with home buying. SmartMoney online put together 10 very common first-time home buyer mistakes. The good news is that any decent Accredited Buyers' Representative (ABR) Realtor would protect their clients from making the majority of them. Read the article ... Here. In 1927 Henry Beston moved into a small cabin (only 20 x 16) on a spit of land just south of the present Coast Guard Station at Coast Guard Beach in Eastham. This short vacation turned into a full year’s stay, where Beston recorded life on the seashore and studied the natural world—the land, the sky, the sea—and the role of man in it. Beston called this 2 room cabin “Fo’castle”. That would be all there is to say if Henry hadn't published his book, The Outermost House a year later. This book is a must-read for any environmentalist and anyone who loves the seashore. There is a great article that provides much insight into Heny Beston's Outermost House... HERE.